U.S. 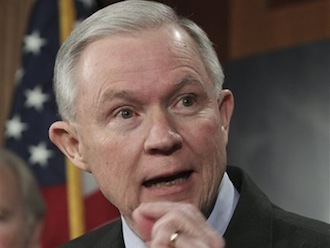 Senator Jeff Sessions (R) from Alabama released a written statement Tuesday after two of his food stamp reform amendments were rejected by the U.S. Senate. Sen. Sessions is the Ranking Republican Member of the Senate Budget Committee. Sen. Sessions amendments would have prevented states from waiving eligibility requirements to receive Food Stamps and would have eliminated bonus pay to states that for enrolling more people. The amendment would have ended the practice of paying states $500 million in bonuses for signing up as many people as they can find was defeated 58 to 41. Every Democrat and some Republicans voted against that amendment. The amendment to prevent states from waiving eligibility requirements was defeated 56 to 43. Sen. Claire McCaskill from Missouri was the only Democrat that voted for the amendment. Republicans Olympia Snowe, Susan Collins, Dean Heller and Scott Brown voted with the Democrats. If the Sessions amendments had passed they would have saved $20 billion from the $770 billion that the government will spend on Food Stamps. 44.7 million Americans received food stamps in FY2011. The Food Stamp program has been renamed the Supplement Nutrition Assistance Program. America’s national debt is $16.8 trillion and is growing at a rate of $4 billion a day. Runaway entitlement spending including Medicare, Medicaid, and Social Security is a large part of the problem. Senator Sessions resides in Mobile.